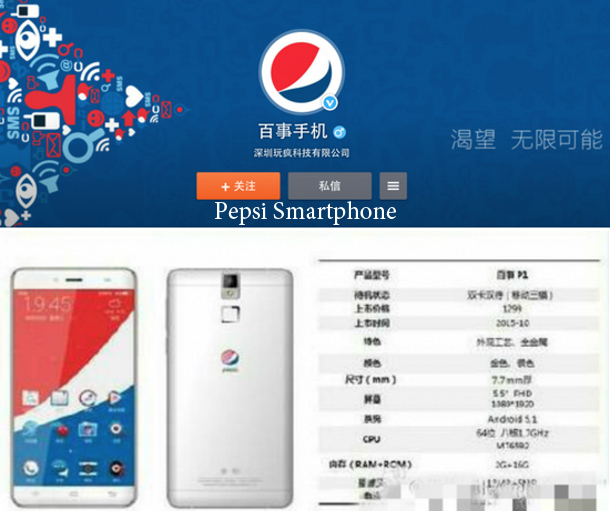 Apparently one of the biggest beverages seller Pepsi will launch its first Android Smartphone in China. There have been a theses about it on the Chinese social media called Meebo and, few android blogs are posting neat details about a Pepsi branded android phone being presented in Beijing on October 20. It will actually be a pretty decent mid-range phone called P1. It will include a 5.5-inch 1080p display, an octa-core processor from MediaTek, a 13-megapixel rear camera (5-megapixels in front), 2GB of RAM and 16GB of storage. According to the first leaked photo of the phone, you can expect it to be “packed” in thin 7.62 mm metal case. It runs Android 5.1 and, the price is expecting to be 1,299 yuan which is equivalent to $205. PepsiCo Inc. share that the phone will be available only in China and that, another company will manufacture the phone. So, no the company is not going into the mobile phone manufacturing business. “But we are committed to engaging with Chinese consumers at this point of connectivity, and in innovative ways, to grow our brand,” it said. The same as “Pepsi Crystal” and video game “Pepsiman” its just the company’s way of licensing its branding.